Russian ​Tourist Gives Birth To Her Baby In The Red Sea. The Red Sea in Egypt is one of the most popular tourist destinations in the world, today it was made more special after a woman gave birth in the iconic location. Curious onlookers in the resort town of Dahab, north of Sharm el-Sheikh, were left stunned as they saw a woman, whose name has not been revealed but is believed to be Russian, give birth. Moments afterwards a man, reportedly the woman’s husband, emerged from the water cradling the newborn in his arms. The woman followed soon after to join her newborn baby and her partner so they could all celebrate in the miracle. Those who witnessed the birth took pictures of the baby’s father and a doctor (reportedly also Russian) who specialises in underwater births. 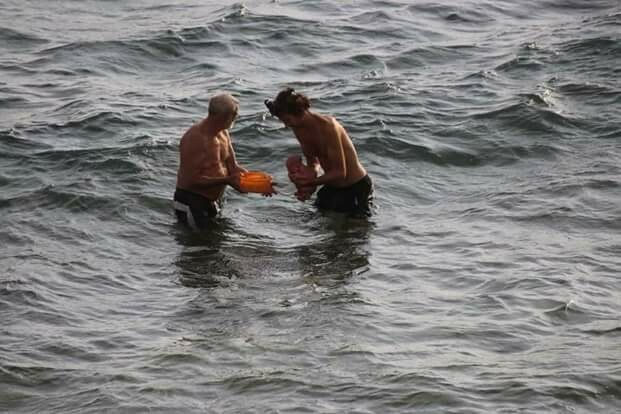 Pictures of the father, doctor and woman emerging from the Red Sea have now gone viral on social media. Photos showed the dad holding the baby with the umbilical cord still attached and the placenta in a plastic container. All of which were snapped by a tourist from a hotel balcony. According to eyewitness accounts, the woman gave birth after going into the sea only wearing a bikini. People took to Facebook to praise the ‘beauty’ and ‘easiness’ of the baby’s water birth. Local media reports suggest Dahab, situated on the south-eastern coast of the Sinai Peninsula (50 miles north-east from Sharm el-Sheikh), has become increasingly popular with mums-to-be who want to have a water birth in the sea. Formerly a Bedouin fishing village, Dahab is considered to be an ideal diving destinations in Sinai. The two aren’t thought to be connected.